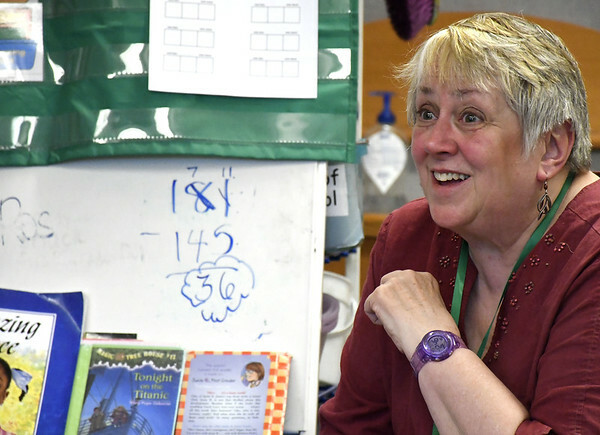 BRISTOL – Storyteller Liz Gruber sat down with the first graders at Ivy Drive Elementary School and told them a story about a town plagued by a monster. A wise old woman came up with the solution to defeat the monster by going to the town square and holding hands so the monster couldn’t get them. As she hunched over and growled to portray the monster, she had the kids hold hands and tiptoe all the way around the classroom, then form a circle and sing nonsense songs until she said the monster got smaller and smaller and finally disappeared. “So they realized they had all worked together to get rid of the monster,” she said. 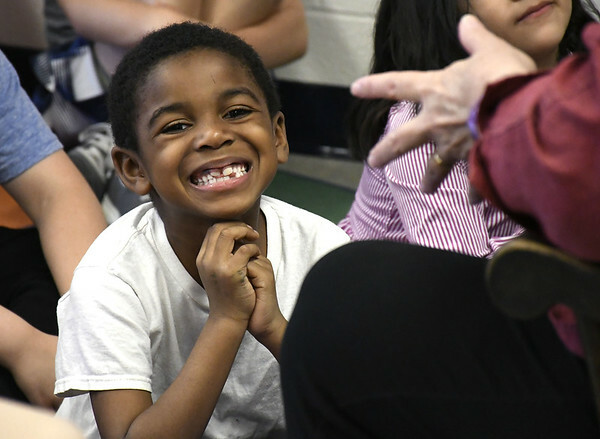 Gruber has been coming to the school this spring as part of a grant-funded storytelling program, which also has storyteller Meris Palmer working with the kindergarteners. Principal Rosie Vojtek said storytelling promotes literacy by building vocabulary, comprehension, expression and listening skills. Vojtek was recently honored at the Connecticut Storytelling Festival & Conference for of her support of storytelling in school. Then a baby boy was born who had light coming out from his armpits when he raised his arms, Gruber continued. As he got bigger the light got brighter, so he would hold his arms up all day long and was known as Sun Man. Eventually Sun Man got tired so he went to sleep in a cave. The children found him and carried him outside. They flung him up into the sky where he spun around with his arms out and turned into the sun. “Was this the 1920s?” asked a boy, causing laughter from the adults. Gruber realized what he meant was - is this story very old? “It is probably about 4,000 years old, and people told it to one another for 3,000 years before anybody wrote it down,” she said. A Hartford resident, Gruber explained that she worked in accounting for years before attending her first storytelling performance. It inspired her to join a monthly story sharing group, where it took her a year before she got up the confidence to get up and tell her first story. She started taking storytelling workshops and eventually got a master’s degree in oral traditions. Posted in The Bristol Press, Arts, Bristol on Tuesday, 1 May 2018 21:19. Updated: Tuesday, 1 May 2018 21:21.